You don’t have to be a psychic to know that objects tell a story. If “object reading” is your objective, however, the “Reading Glove” by Joshua and Karen Tanenbaum, however, puts the gift of psychometry, quite literally, in the palm of your hands. The husband-and-wife duo, who specialize in interactive design, developed the glove as part of an immersive storytelling platform that they’ve dubbed the “Tangible Ubiquitous Narrative Environment” or TUNE. “We wanted to see what happened when we gave people a story that was embedded on real, physical objects that could be played with and moved around,” Karen told O’Reilly Radar on Wednesday. Although the Tanenbaums envisioned an entire room that told a story as you explored it—”sort of like a haunted house, but intended to tell a specific narrative rather than just be spooky”—their budget led to a more modest version of that space: a tabletop, to be exact. 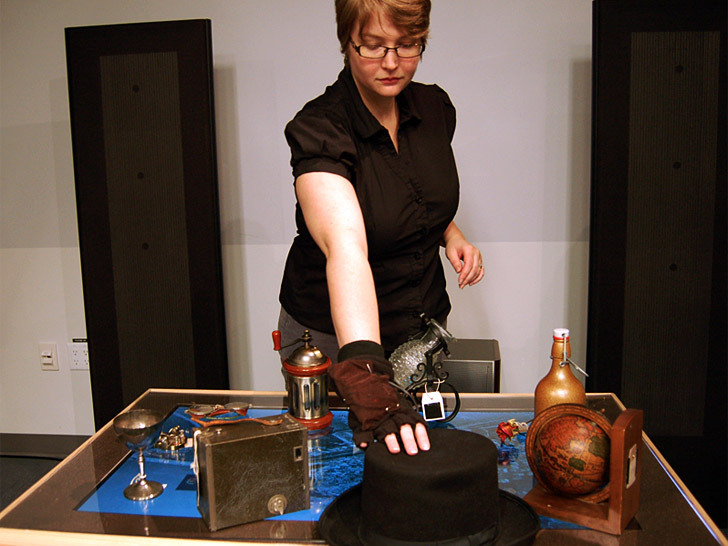 Using RFID tags, the Tanenbaums embedded a series of “artifacts” with story fragments for the glove to read. You don't have to be a psychic to know that objects tell a story. If "object reading" is your objective, however, the "Reading Glove" by Joshua and Karen Tanenbaum, however, puts the gift of psychometry, quite literally, in the palm of your hands. The husband-and-wife duo, who specialize in interactive design, developed the glove as part of an immersive storytelling platform that they've dubbed the "Tangible Ubiquitous Narrative Environment" or TUNE. "We wanted to see what happened when we gave people a story that was embedded on real, physical objects that could be played with and moved around," Karen told O'Reilly Radar on Wednesday.